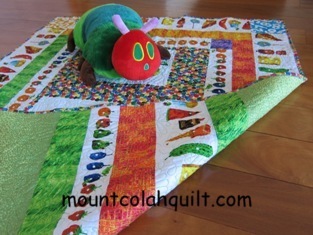 I bought this 'The Very Hungry Caterpillar' quilt kit when the fabrics first became available a few years ago. 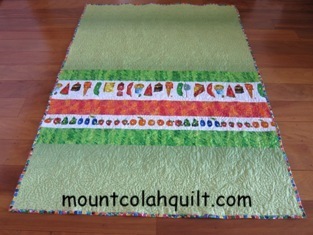 It's an easy quilt top to piece but finding a block of time to finish it in one pass was much harder, so taking quite a while to get done.!! 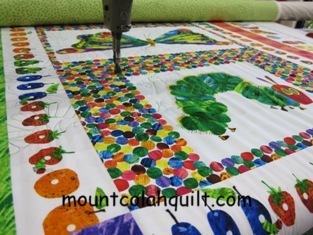 There was a generous amount of fabrics given in the kit, enough for me to also use as part of the quilt backing. 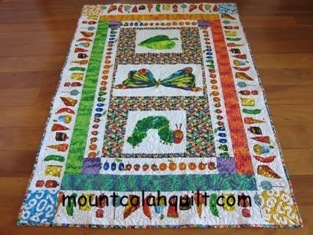 It was always my intention to make the quilt for my Sunshine, and he's now using it. The cushion was my most recent Christmas present but it has to be 'lent' to my Sunshine for 1 billion days in return for me to have the story book (his first birthday present) to read for ONE day, and that's fair.!!! 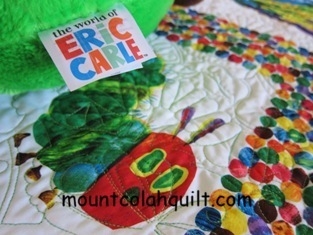 The quilting pattern, 'Caterpillar pano_02640', was by Kim Diamond, and of course, it was quilted on my wondeful Gammill Statler Stitcher. Looks good Emma. Hope the heat yesterday wasn't too bad. Am still battling with my blog. Thanks. Let me know if I could help in any way with your blog.